Unions in Michigan represent over 900,000 workers and take in more than $250 million in membership dues annually. But in spite of their expansive wealth and political power, requirements that unions disclose their financial dealings are minimal. Reform of the federal reporting system, which governs private-sector unions, is needed but unlikely in the current political climate. 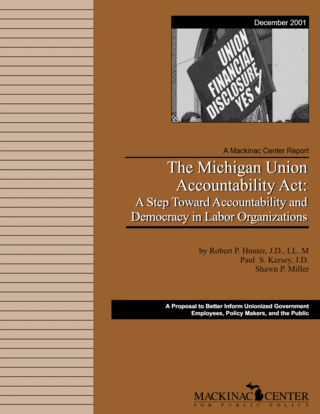 Michigan can take the lead by passing its own Union Accountability Act, requiring annual financial disclosure reports and independent audits of public-sector union affiliates active in the Great Lakes State.